Sunshine, clouds, wind, rain, sleet, hail – whatever kind of weather we wanted, we got it today, several times over. Hardy Seattle Urban Sketchers who opted to sketch outdoors had an exciting morning dodging rain in Tacoma’s antique district, but I chose the dry and comfy corner window table inside Tully’s. 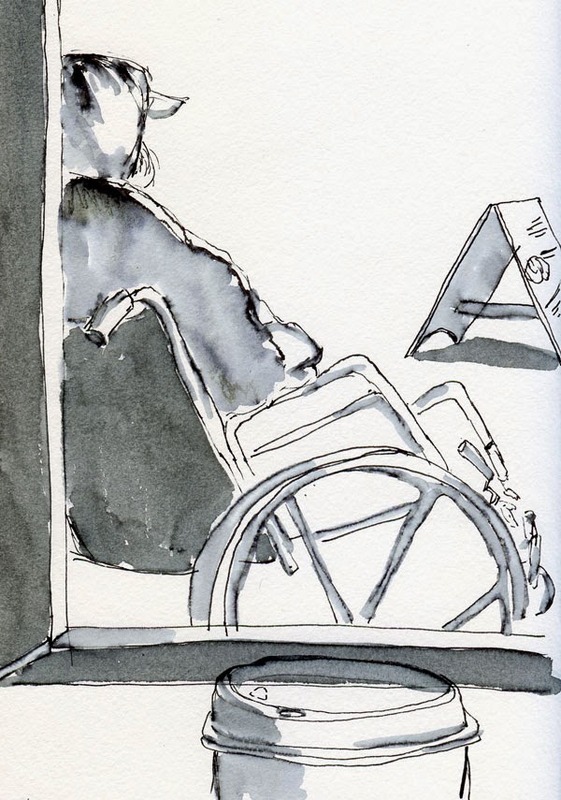 My warm-up sketch was a man seated in a wheelchair just outside the window. Fortunately, an overhang above him kept him dry, because right about the time I finished that sketch it started to pour. Across the street was the grand old Rialto Theater, home of the Broadway Center for the Performing Arts. 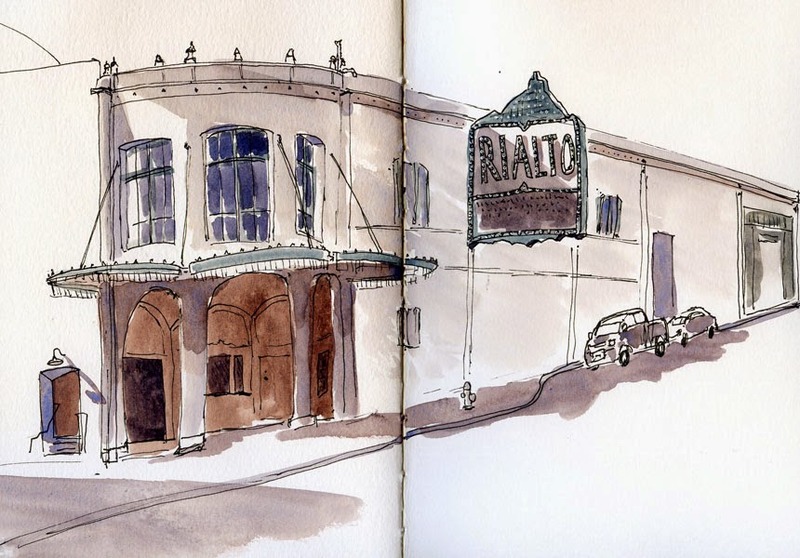 Now on the National Register of Historic Places, the Rialto originally opened in 1918. Unfortunately for me, it stands on a steep incline, which made my perspective wonkier than usual. But fortunately for me, the sun came out for about five minutes – just long enough to put in some shadows. 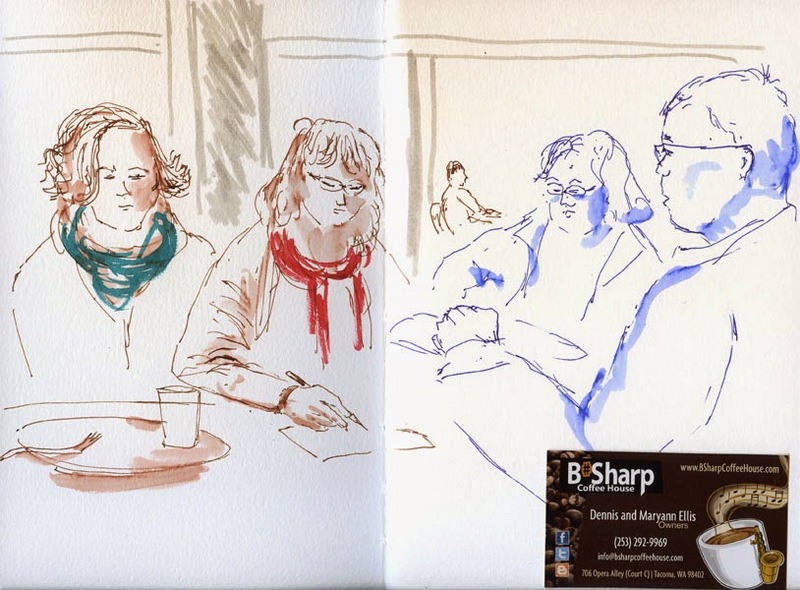 After sharing sketchbooks and meeting a number of new members (a surprisingly large turnout for a day of iffy weather), several of us walked a few blocks to B Sharp Coffee House for lunch. After enjoying one of the best grilled caprese sandwiches I’ve had in a long time, I snuck in a sketch of some of the other sketchers. Left to right are Nilda, Jane, Gail and David. (When Jane saw that I was sketching her, she sketched me on a napkin!) (Halfway through my sketch, I dropped my favorite Metropolitan pen, and the poor nib bent in half! I’m going to either fix it myself or see if it can be replaced.) Also at lunch were Frank and Frances, but I ran out of space on my paper, so they were spared. Before heading back home, I stopped in briefly at King’s Books, where the Wayzgoose Letterpress and Book Arts Extravaganza was going on. Many local printmakers and book artists were selling their work and demo-ing presses. I enjoyed thumbing through a stack of beautiful reproductions of Chandler O’Leary’s sketches, made a tiny print from an old platen press and bought a small notebook from Orange House Press. The funniest moment was at the table of an artist who had an old manual typewriter. She was showing a boy how to type, advising him to strike each key firmly, one at a time. A second boy came up to him, stared at the contraption and said, “What’s that?” Another (also gray-haired) observer and I looked at each other and laughed ruefully, feeling really old.